The following post is from a volunteer who we had the pleasure of hosting from the University of Nebraska Athletics department. 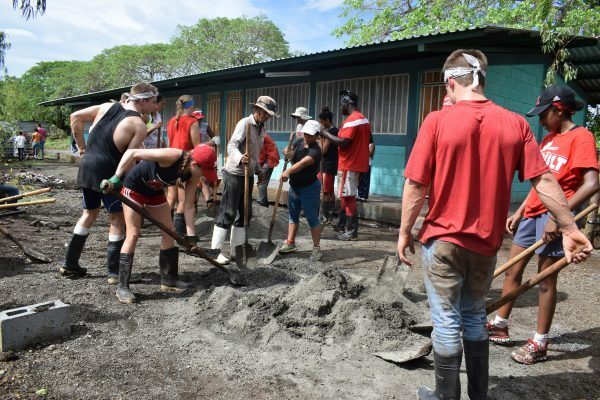 The group volunteered a week of their time during a service trip to Nicaragua helping to build a school in the community of Villa Japon. By Nina Radulovic — You can say our trip started on May 7, a day after finals week but it really began during all the different moments we were serving people and the environment. A culture we adopted at Nebraska, to spread integrity, trust, respect, teamwork and loyalty already prepared us for Nicaragua. When I used to travel to all the different countries, I never spent time thinking how I can change the community for the better in my short stay. My trips usually revolved around me and the people I was traveling with. The difference and more importantly the beauty of the seven days spent in Nicaragua are that people who we met affected our self-growth not the other way around. The moment we arrived in Nicaragua, I knew there will be little breaks, and so many new exciting things we would see throughout the days. To help me remember everything better I decided to think about each day as a lesson. As we were flying from Omaha to Managua, the capital of Nicaragua, I got to talk to many people. I could see and feel the combination of concern, excitement, and fortitude in everyone’s eyes. As much as we wanted to stay calm, participating in a service trip or simply traveling out of the country for the first time were all new to most of us. What was important for me to do and what I remembered travel day by is the importance of taking a deep breath in and a deep breath out, embracing the moment. New friends, a new country, and new language may be overwhelming but how many times have we competed on a sports field we have never seen before, how many times have we taken a class with the material we have never heard about before? As soon as I was able to take my time, take slow and deep breaths, and remind myself that things I have done in the past twenty years of my life have prepared me well, I was able to say all of us were ready. If you wonder what I meant by ready, it was anything and everything. We are all student-athletes, used to give our best in our respective sports and in the classroom, so one thing I knew for sure is that when tomorrow morning came we would place all of our hearts into the work for the community. Another important lesson I learned is that every experience is valuable, even if you spend the night at Nicaraguan customs hoping your green card will find its way to you. Chongo, a former football player experienced exactly that and he joined us a day late. Why was even a situation like Chongo’s valuable? Because it makes us remember. Chongo lost one day of only seven we get to spend in Nicaragua. After our trip, we realized every day was as important as the last one. Us and Chongo will forever be reminded that seven days don’t even begin to compare to the lives of people native to Nicaragua but they do make us more aware than we were seven days ago. The more we and others realize it is not rainbows and butterflies everywhere and that it’s important to both empathize and act on that empathy, things will start changing for the better. The next morning, after we woke up and had breakfast, we gathered around in a circle and had the opportunity to share a little bit about ourselves and our expectations for the week. Casey, Seeds of Learning leader started by introducing himself, saying one fun fact and what his expectations were for the week. As he finished, he threw the rope to Jordan who did the same thing. A crisscrossed pattern and ten minutes later, we got to hear about everyone’s goals and expectations for this service trip. My expectations were to try and identify with all the people from Villa Japon, Managua, Tipitapa, and other communities we would visit. The lesson I learned during our first full day was about the power of a smile. For us, non-fluent Spanish speakers who said gracias, muy buen and me amo… a million times a day, a smile was the key into the lives of Nicaraguan people. Smiling at men, women, and children was a sign we were genuine in our actions and that we saw positivity in diversity. 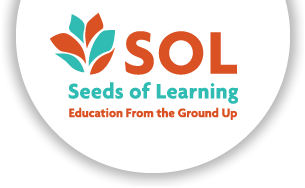 It was definitely easier to work knowing we are welcomed not just by Seeds of Learning but the community as well. The first time we arrived at the school, kids came out of the classrooms and jumped into our arms. We got to play with them for awhile and then we started the cultural exchange activity – we danced and sang for at least an hour. It was a great way to start our first day of work – meeting kids who we’re doing it for. After we got some early morning motivation the physical work started. We put on our working shoes, gloves and bandanas ready to conquer the mud. The goal for day one was to clean the mud out of one side of the trenches so we can pour the concrete before the next rainfall. You guessed right, we made even better progress and emptied more than half of the trenches. All of us partnered up with at least one other person and made everything much more efficient. In a matter of hours, one whole side was clean and ready for the concrete. After the day’s work, we walked to the nearby library and met more people from the community. What amazed most of us after getting to ask the locals some questions was how early they get married. In one of the Nicaraguan communities, people marry as early as 13 while the common age is from 15 to 18. To me, such early marriage was interesting because it reveals that the community expects a high level of maturity for such an early age. Another amazing thing Nicaraguan people shared about themselves were their holiday traditions. An interesting holiday they celebrate is the Black Christ – when the nearby volcano erupted the whole town went down with it, only the church was left standing. The statue of the Christ survived the eruption and ever since then the people celebrate Black Christ on January 15th. Our first working day was concluded with meeting the people we do it for, those who are just like us – dream chasers with a desire for better education and a happier life. Day three was definitely marked by understanding personal privileges. In the classroom, we learn that inequality in the world comes from the system that favors one group more than the other but only now I got to experience it first hand. Perhaps the most important privilege I recognized on this trip is the fact that I don’t have to start from scratch – I have a safe home, education, health care and many other things I don’t have to worry about because they have always been available to me. But even though life in Nicaragua is incomparable to the western standard we’ve all been used to, happiness is possible. On the second day, we visited a local farm and the moment I was welcomed, I knew it was more than just a visit to a stranger’s house, it was entering someone’s home and seeing how their comfort looks like. The whole house was the size of my freshman year dorm but it was enough. The first thing I noticed was a mirror and antlers on top of it and in that moment I couldn’t remember what are all these things that keep my room so full, do I use them and are they necessary? Most of them aren’t and as much as I would like to say I can live without them starting tomorrow, consumerism became a huge part of my life. We all embrace it by shopping for newest styles every season or walking down isles and isles of cereal and we are all guilty of leading a stuff-abundant life. Realizing that wasn’t the most positive experience but I learned that the first step to change is getting exposure to the real state of things and starting the conversation about it, without the fear of criticism. If antlers and a mirror were all the room decor our host needed next time I redecorate my apartment I will remember him. However, the highlight of my day was the moment when the community joined us at the construction site. Both younger and older people worked with us and helped both groups be even more efficient. By motivating each other we inspired the community to follow us, we showed them we value their education and we could see they appreciated our effort by helping out as well. The efficiency we brought in was something I saw as a big difference between the American culture and the Nicaraguan lifestyle. Every day I wake up in Lincoln I think of ways of how to be more efficient, how to do more in less time. We tend to be better and more successful when we are more organized but sometimes we forget to put a cap on it, we forget that making mistakes and learning from them is something we should embrace. Spending time with people, enjoying the conversations, and living in the present moment is as valuable as getting the job done before it’s due. In this fashion, Nicaraguans take it slower. Maybe the school we’re working on could’ve been built faster using better materials, tools and trained labor but the fact is it wasn’t. Our approach achieved an intimate relationship with the product – the school in Villa Japon and Nicaraguan education. Companies and workers often come and build the facilities without getting the community involved. I know we did something special in Villa Japon because we inspired the community with our integrity and teamwork. Fourth day’s lesson was about genesis. We got to visit a volcano that was recently active, a pottery village of San Juan de Oriente and a zip line. The volcano was breathtaking, we could see the lava, the smoke and how simple nature’s creations tell a story about us humans. While I was watching the pottery maker quickly mold his ceramic with amazing precision I felt a connection with the mud from Villa Japon, the shovels, and the wheelbarrows. He told us it took him years to perfect the high relief technique and his pottery now is indescribable – his vases carry everything from turtles to snakes to traditional Nicaraguan patterns… In a way we were pottery makers too – a small group that decided to come together and express dreams of a kinder world in a country that seeks to improve access, quality, and value of education through manual work and community engagement. His art were the bowls, ours were the classrooms so that hopefully one day every child that wishes to become a pottery maker has the opportunity to do so. The volcano will create lava, the pottery maker will create vases, and we, we will continue to make an impact wherever the world takes us. Perhaps my favorite day of the trip was day five. We got back to Villa Japon to continue our work and we had a scheduled activity with the kids. The day’s assignment was to tie the wires around the metal framework and pour more concrete. The work was not as physically engaging but nonetheless, we needed time to finish such a delicate job. To go with my favorite day is the favorite lesson, a lesson of small deeds and big hearts. During our short breaks we would go into classrooms to meet and play with the kids. Two of us would sit around the table with six kids and you could see their faces light up as soon as we took out some construction paper and green and yellow paint. During that short break, we were teachers and the kids were our students. Each of us would take a paper, some green paint and show a kid how they should make corn leaves with palms of their hands. Then, we took some yellow paint and made the cob in the middle. Minutes later, the kids could see a corn and we could see how happy they were. Another activity we did with the kids were the Mother’s Day cards. In Nicaragua, Mother’s Day is celebrated on May 30. On our first day in Villa Japon many children said their mothers are their role models so taking a polaroid and decorating the card with glitter seemed like a perfect idea. Little did we know that after pouring cement and putting a smile on a kid’s face the community will throw us a party. When we came back to Tipitapa, an instructor and several students gave us dance lessons. That night we were able to experience that music is the world’s most famous and popular language. There was not a single person who hadn’t stood up and danced to the Nicaraguan and American beats. We even got to try on their colorful dresses and straw hats. Our stay was filled with small deeds, and it was the kindness behind them that made them so meaningful to the community. And as if the time wasn’t flying by too fast already, our last day in Villa Japon arrived. For many of us, it was probably the last day we will ever see the kids, their smiles, little uniforms, and give them a hug goodbye. It was difficult to choose a lesson for the day because of so many emotions that were surrounding us but the word fierce seemed most appropriate. 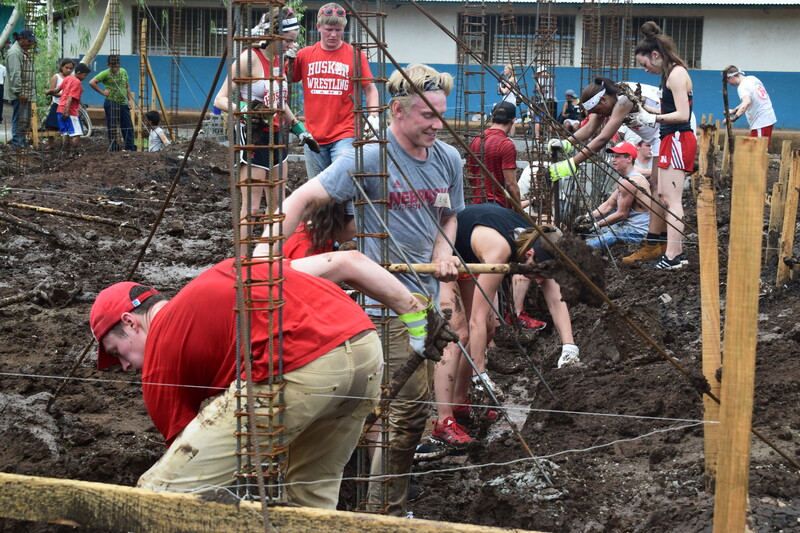 In so many ways, the kids in Nicaragua are relentless – they would come into the trenches just to help us dig the mud faster, they would come to the activities to see how people from outside their country look and sound like. I can say without a doubt fierceness they hold will make it easier for me to shoot for my team, talk to new people, and share my stories. They proved to us that poverty is nothing to be ashamed of, nothing that makes people less humane. Instead, poverty is a situation they are in and against which they are using their smiles, hands, and feet. In Serbian, my first language, we have two words that both represent wealth. The first one is “bogatstvo” which has the word “God” in it and represents the spiritual wealth of a person – the happiness from within. The other word is “imućstvo” which represents financial or more specifically property wealth. Calling people either just rich or just poor may sound unfair because wealth entails so much more than the newest iPhone or a three-story brick house. Wealth is about seeing beyond materialistic gains and recognizing necessity, understanding personal privileges and selflessly helping others overcome adversity. Simply, knowing what and when is enough, using it yourself but saving for others. The wealth of the kids of Villa Japon are their smiles which will make them new friends, their hands which will make Mother’s Day cards, and their feet which will take them to their new classrooms. My wealth is about being a Husker and getting the opportunity to open my mind, change my view, and leave my mark in Nicaragua and elsewhere. 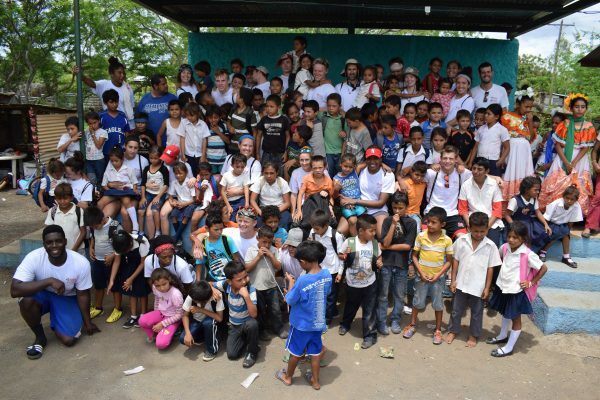 A service trip to Nicaragua. What none of us 27 Husker student-athletes imagined and everything that we hoped for.